The eighth Hornet (CV-12) had an extraordinary combat record in WW II, engaging the enemy in the Pacific in March 1944, just 21 months after the laying of her keel and the shortest shakedown cruise in Navy history (2 weeks). For eighteen months, she never touched land. She was constantly in the most forward areas of the Pacific war - sometimes within 40 miles of the Japanese home islands. Her pilots destroyed 1,410 enemy aircraft and over one million tons of enemy shipping. Her planes stopped the Japanese super-battleship Yamato and played the major part in sinking her. She launched the first strikes in the liberation of the Philippines, and in Feb. 1945, the first strikes on Japan since the Doolittle raid in 1942. The "Grey Ghost" participated in virtually all of the assault landings in the Pacific from March 1944 until the end of WW II, earning 9 battle stars and the Presidential Unit citation. In 1969, Hornet recovered the Apollo 11 space capsule containing astronauts Neil Armstrong and Buzz Aldrin - the first men who walked on the moon - and Michael Collins. A short time later, she recovered Apollo 12 with the all-Navy crew of "moon walkers". The F/A 18 fighter plane is named after this distinguished ship. 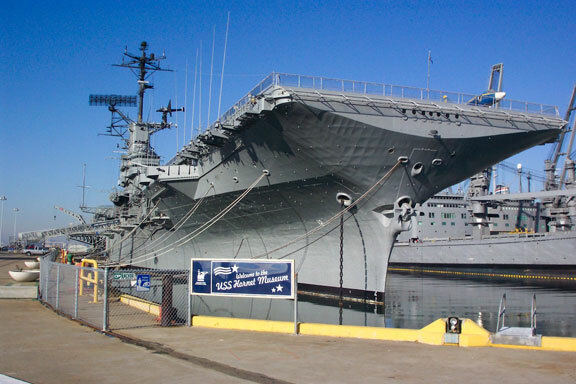 USS Hornet is a National Historic Landmark and a State Historical Landmark. The ship is located on the east side of San Francisco Bay. A "Living Ship" demonstration is presented on the 3rd Saturday of each month. The ship is host to patriotic events and is also available for private parties. 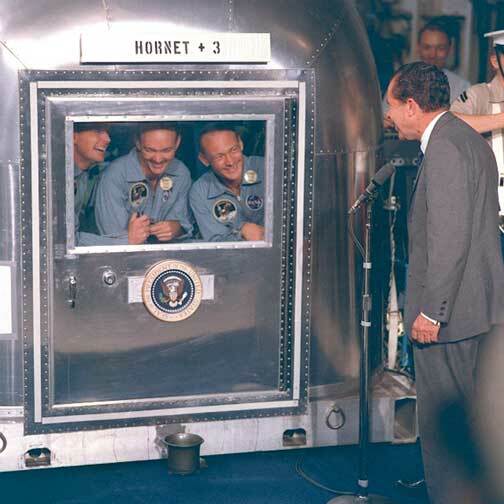 Apollo 11 Astronauts Speak with President Nixon Aboard USS Hornet.